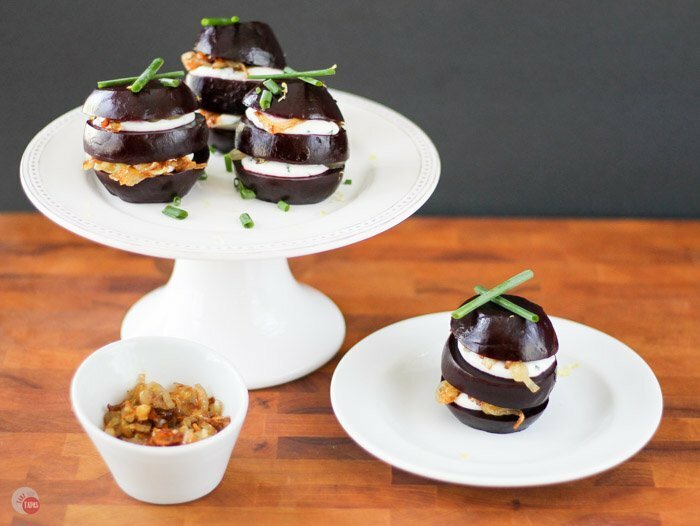 Assemble a gorgeous appetizer or salad course of pickled roasted beet napoleons with goat cheese and caramelized shallots. Make everything ahead of time and wow your guests when it’s time to eat! Have you heard my story about the first time I ate a roasted beet? Buckle up because you are in for a treat. 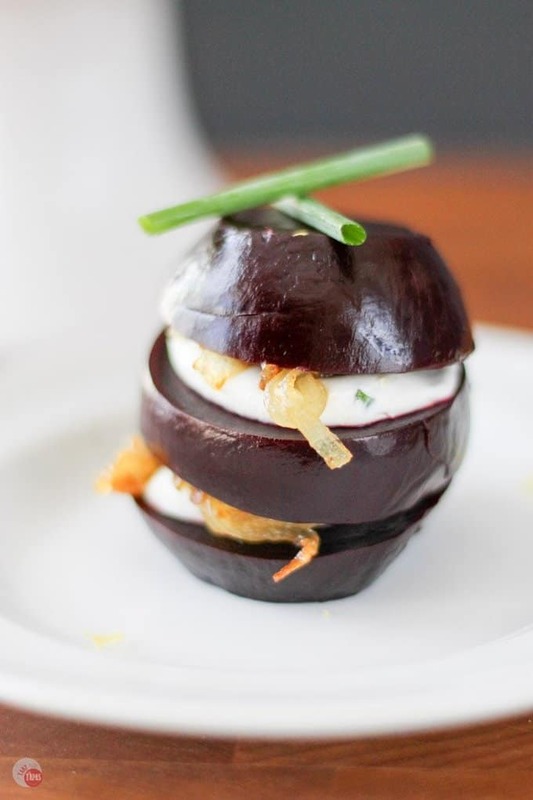 These beet napoleons are Earthy layers of pickled beets, creamy goat cheese, and buttery shallots. Growing up my mother made pickled beets quite often. Her recipe was a quick one of canned beets, thin-sliced onions, and an oil and vinegar mixture. Maybe a dash of sugar if they were too tart. I loved them so much that I was often in trouble for eating a large portion of them the night before they were to be served. Fast forward more years than I care to mention to present time. A recipe found in Southern Living for a beet and asparagus salad, found by my mother in law Judy, was to be our show-stopper for Christmas Dinner. The salad contained roasted beets, asparagus, and feta cheese tossed in a vinaigrette and served over greens. We had never roasted fresh beets before. Something new for us both! We read the recipe and immediately got started. We had never roasted fresh beets before so this was something new for us both! We dove right into making it! Once we roasted the beets and the asparagus and got everything ready to assemble. Once we put the whole thing together we were so excited and proud! Not everyone shared our enthusiasm for beets so Judy, my mother Kathy, and I ate the whole salad. The one meant for 12 people. The salad tasted so good. The meaty and Earthy beets were tangy with the dressing. Once we were all done eating we started to wash the dishes. We all took turns in the potty as we had a lot of tea to drink and you can’t put your hand in warm water to do the dishes without having to go. As we each rotated through the facilities, we noticed that we each had a look of concern on our faces. After we asked the question, in hushed whispers, we confirmed that all our urine had turned bright pink. Because we had never roasted beets whole before, we did not realize that they retained all the natural color that normally leeches out in the canning process. Ever drain a can of beets? Imagine all that bright red liquid now flowing through your body in concentrated form. Also, that stuff stains worse than a Sharpie! All three of us had a nice laugh from that experience and it did not deter us from roasting fresh beets every chance we get. The golden beets are even sweeter! 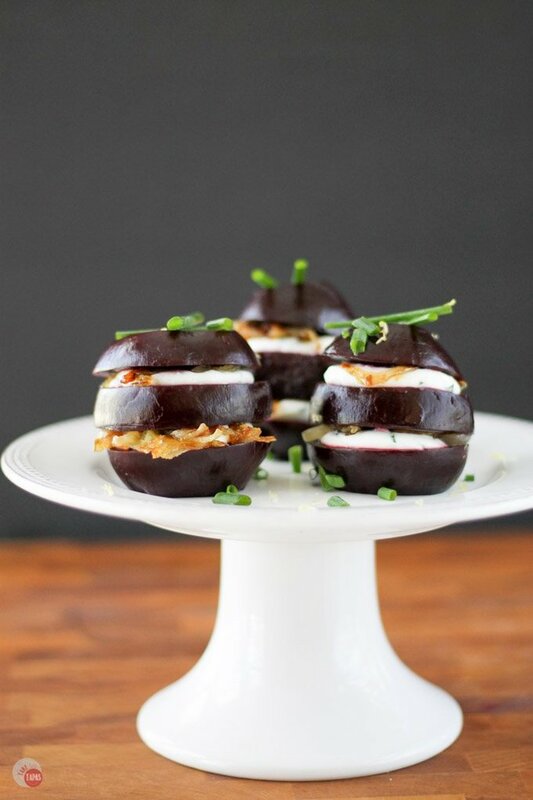 These pickled beet napoleons will be the show-stopper on next year’s Christmas table. 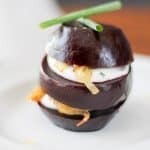 I am such a sucker for pickling foods that I love to make these pickled beet napoleons! Probably more than I like my pickled red onions, pickled red cabbage, and even my pickled boiled peanuts. That’s saying a lot considering how much I like these! Chop the greens off the beets leaving the skins on. Place them on a sheet of foil on a baking sheet. Bring up the sides of the foil and pinch at the top to make a pouch around the beets. Place in the oven and bake for about 45 minutes or until fork tender. *I stick them with a steak knife to see if it goes in without much resistance. You can store them in the fridge at this stage until ready to use or cool completely and peel. When ready to make the pickled beets remove beets from pouch and peel. You can use the paper towel method I explain later or you can peel with a knife. 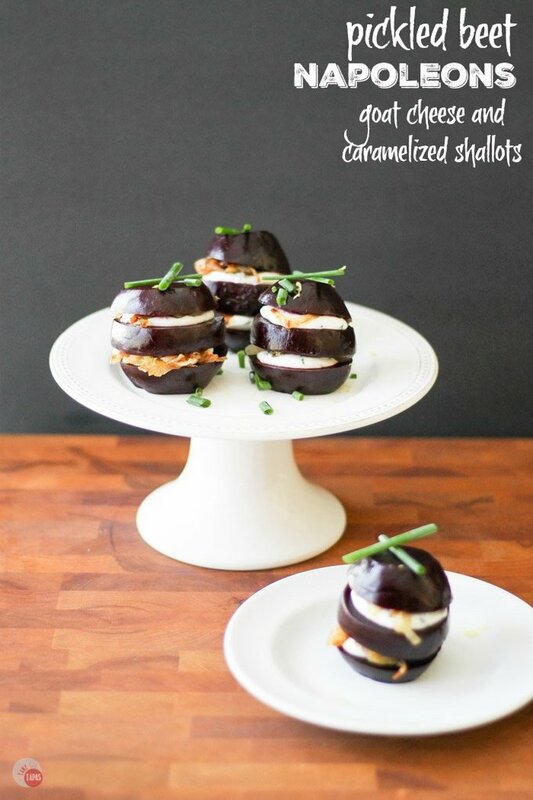 Slice your beets to make the Napoleon layers. I keep mine about 1/4 to 1/2 inch thick. Make your pickling liquid by bringing the water, vinegar, and sugar to a boil. Add the beet slices and remove from heat. Let sit in liquid for about 10 minutes. To make the caramelized shallots, place the shallots, garlic, and olive oil in a pan and cook over medium heat until they start to get translucent, or clear, and soft. Continue to cook until they turn golden brown and absorb the butter. Remove and save until ready to stack. Make your goat cheese mixture by combining the goat cheese, sour cream, and lemon zest until fully incorporated. Add in the chopped chives. When ready to assemble, place a layer of beet down on your serving plate, add some goat cheese mixture either with a knife or squeeze it from a piping bag. Layer with another beet slice, more goat cheese, then shallots. Top with another beet layer and garnish with chives. Continue until all the stacks are made. A great tip for peeling fresh roasted beets is to let them completely cool. Take a paper towel in your hands and gently rub the beet. The skin, if roasted enough, will just slide off. It will stain your hands so you might want to wear some disposable gloves. I don’t really mind it because it only lasts for a day and I like to feel my food as I prepare it. Store them in the skin or not. I like to have mine peeled and chopped in a container for easy eating. Just toss on a salad or eat out of the container. Store them in the skin or peeled for up to a week in the refrigerator. I like to have mine peeled and chopped in a container for easy eating. Just toss on a salad or eat out of the container. These beet napoleons will convert any beet hater into a beet lover. 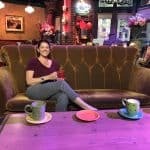 This post first appeared as a guest post by me on Restless Chipotle.